My affection for wisteria grew out of my love for lilacs. 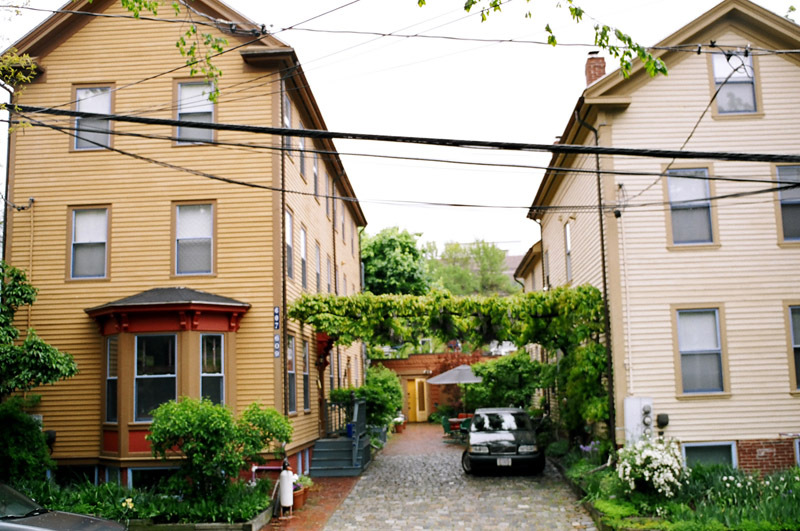 When I discovered wisteria on houses in Cambridge I was blown away. I was abt 23 and had never seen wisteria before. They were so fabulous climbing columns, hanging over porches, draped along fences. 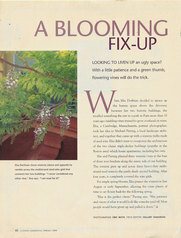 I had no idea that getting wisteria to bloom wd require patience, patience, patience...... and lots of luck and prayer. 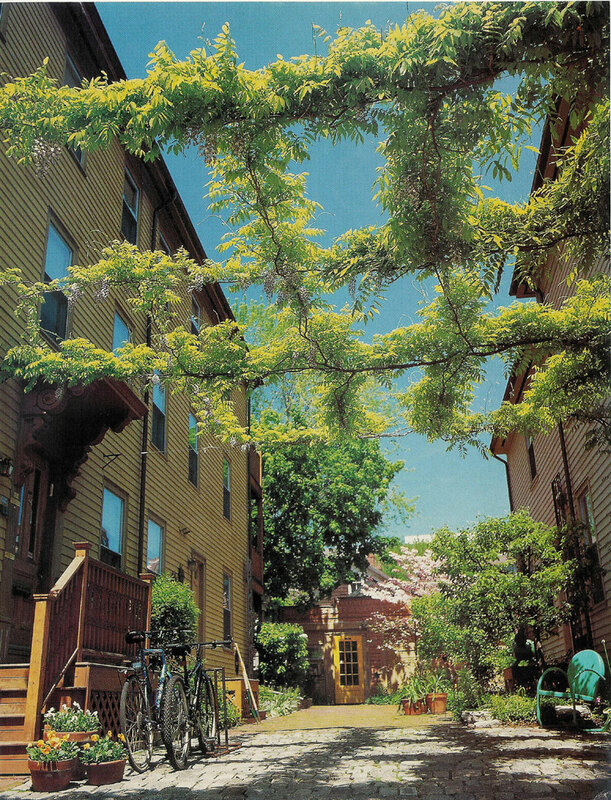 In 1980 I planted wisteria along a chain link fence separating me from my neighbor. And I planted some against the concrete back of another neighbors garage. That back of the garage was a wall of my garden. That neighbor was sure my wisteria wd take over her garage and eat her cement . She made me remove it. So I dug those wisteria out and planted it along the chain link fence. Since it doesn't take long, maybe a week, for wisteria to climb over a neighborhood chain link fence, I wove the stems through the links of the chain. At that point I had NO IDEA there were several varieties of wisteria w/ substantial differences. My wisteria gets all leafy first and then blooms. 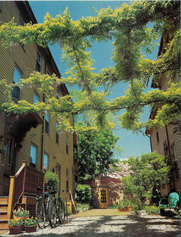 When I was in Paris in 1985 I saw wisteria hung on wires between poles in one of the large city parks. 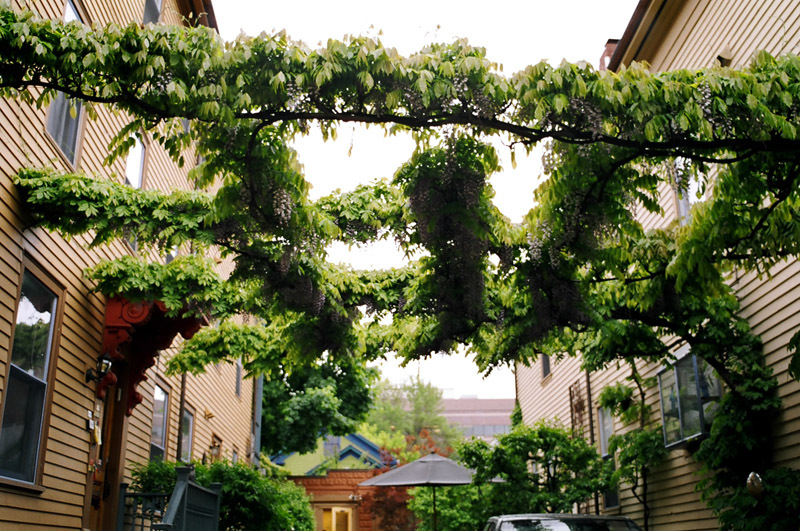 Our driveway was really ugly and I got the idea from that park to make an arbor of wisteria. I also must have had a subliminal memory of sukkahs from my childhood in Roxbury, MA. My father and especially my uncle, Abe Kotzen, were huge supporters of the Mishkan Tefila sukkah because they were in the fruit business. So I strung the wires between our house and the house next door. We share the driveway. I planted four wisteria plants in the ground against the house. I use the communal "I". Michael Piering and his crew, John Lundstrom, Jim Lundstrom all helped me w/ the configuration. 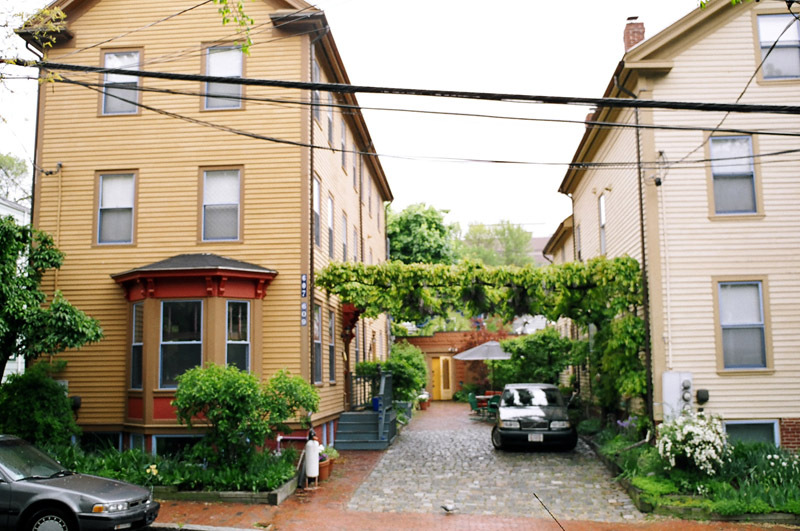 I don't have ANY pictures of the wisteria being trained to cross over the driveway. It took forever. Very careful pruning. Once I got impatient and pruned recklessly. I cut a major lead and lost almost a year of growth!!! 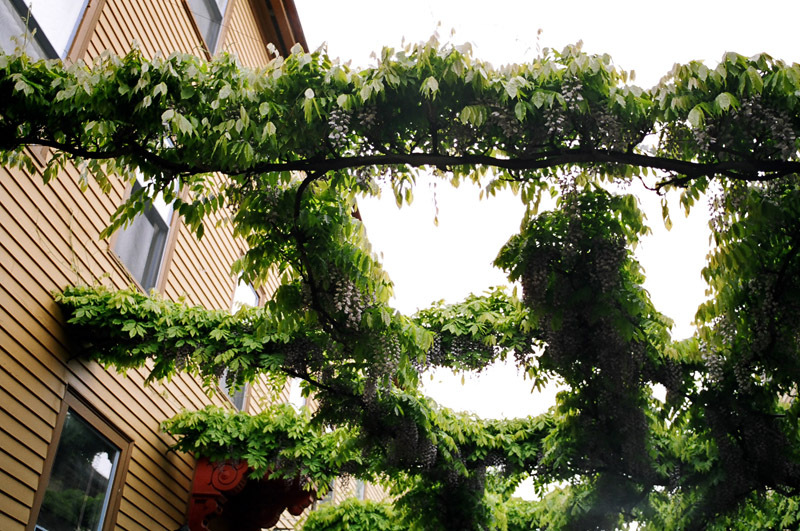 Several people pruned the wisteria over the years. No surprise. 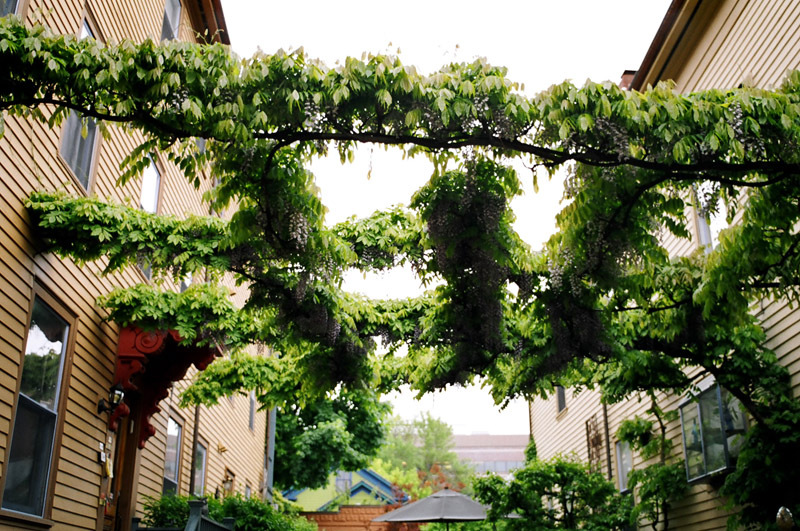 The wisteria needed to be pruned almost every three weeks!!!! I was terrified when Michael Piering, John, Jim or Justin Laird Wylie wd stand on the high ladder on our cobblestone driveway . Finally, after abt FOUR years, the wisteria reached the other side of the driveway in the window pane pattern we'd established. I hate to say it but it was several more years before we got one blossom!! bI really moaned and groaned abt NO BLOSSOMS. Kyle Nicholls says philosophically, it's hard to watch things grow. But we are talking years. One mistake I know I made is that I overfertilized the wisteria beds.....I added manure to all my beds and the manure was too rich for all of them. 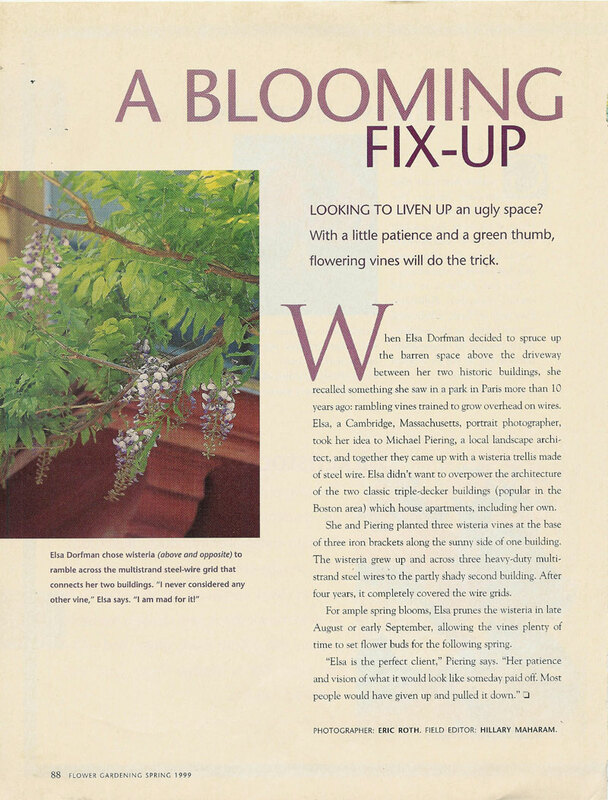 But I might might have done the trick when I poured concentrated Epson salts and warm water on the wisteria plants. Lots and lots of it. A few seasons later, blooms appeared. Slowly. One year I only had three blooms. 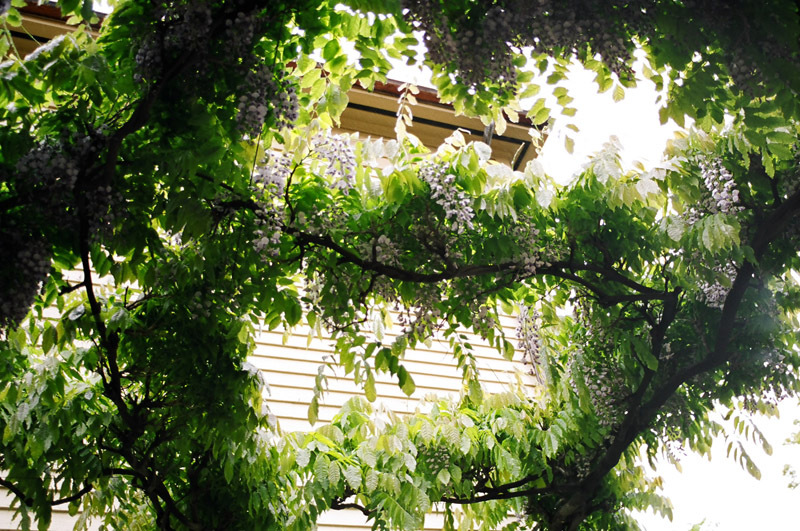 In 2005, the 18th year of the wisteria arbor, we had the most lush blossoms ever. I have no idea why, but I was thrilled. Was it the pruning? Was it the weather? Was it just because it was about time? Every day I smiled at my vine. The blossoms lasted almost a month because it was so cold here in Cambridge. I remembered years when the wisteria wd feebly send out a few blooms on May 10 and be over by May 16. I got very philosophical abt my wisteria. I reminded myself that I might never again have such luck w/ the blooms. That having/ enjoying the blooms and the magic ONCE was more than enuf. The vine is a living plant and who knows what next year will bring. And nothing can ever stay ever the same. i remind myself how much gardening is abt life and death, more like death or more like life depending on my mood. Like photography which is abt being grounded, abt life and abt death too. In this garden that i've had for 25 years i can reminisce abt fabulous bushes, glorious clematis climbing up two stories and following the back porch, foxglove, wonderful plants that were part of my life and our landscape, that had their designated places in our garden, that didn't make it through their final winters. 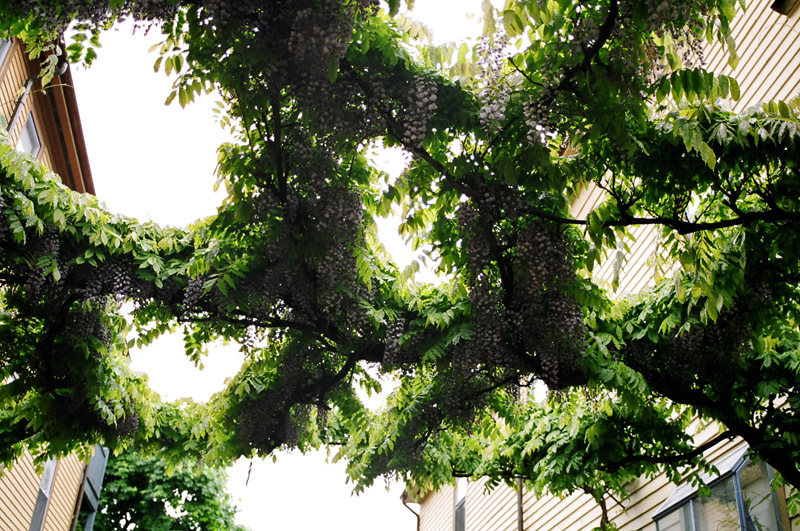 A special thing abt the wisteria is that it is marvelous in several cycles. There are obviously the blooms. There are the pods. There are the pods when they ripen and hang on the vine. There are the pods when they make a snapping noise and fall. There are the buttom shaped seeds inside the pods. (I've been told these seeds are poisonous.) There is the Giacometti sculpture of the vine in the winter against the clapboard of the house. The shadows of the skeletal vine move along the length of the house as if in dance. In the photos of the houses, see Grimshaw, my penguin scultpture by John Lundstrom, standing sentry. On the nite of Harvard's 2005 graduation Grimshaw was stolen from his post. He had been our totem for eleven years. 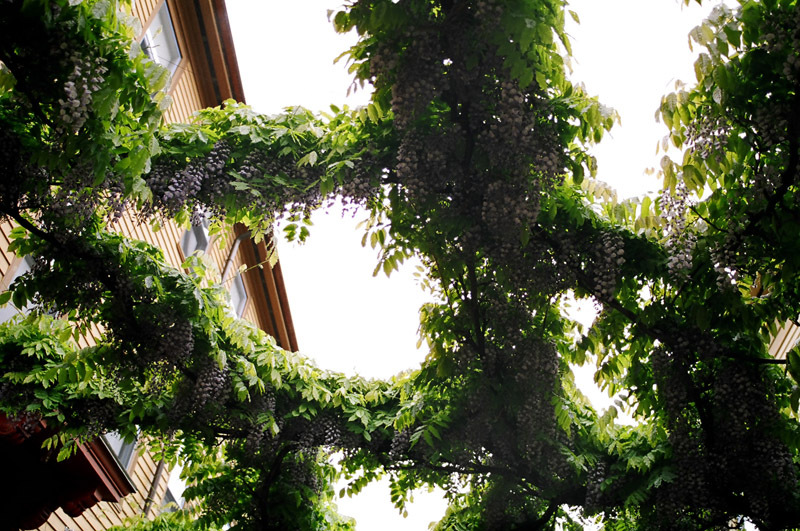 In 2011 the wisteria got attacked by bugs. We weren't sure if it was a weakness in the plant, if the exhaust from the heating system had hurt it, that we had backed into it one time too many. A lot of the plant has died. We are waiting to see what it will look like this year.